The Assembly Secretariat contributes in the domain of “PARLIAMENTARY” oriented business to the advancement of society through legislative research, creative activity, constituents’ inquiry, and development of knowledge on the functionary of the members’ of Parliament and Cabinet. The Assembly preserves and promotes past, current and futuristic scope of legislative Norms and best Parliamentary practices to achieve local and millennium goals. 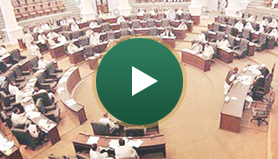 The Assembly also, serves the citizens through public participation through visits and provision of public record related to MPAs and organizational structure of the employees. The Secretariat is dedicated to the production of quality human resource for the knowledge-driven orientation and understanding of the people of Pakistan and Khyber Pakhtunkhwa in particular.